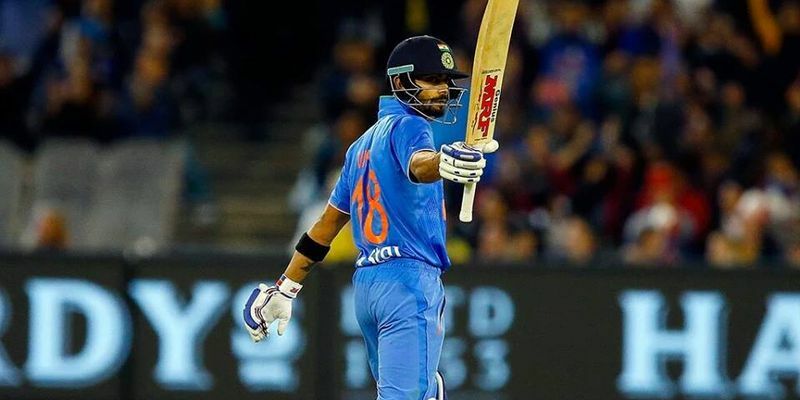 India took an early lead in the six-match ODI series thanks to a brilliant performance by Virat Kohli (112) and Ajinkya Rahane (79) who led the side to a comfortable six-wicket victory. Earlier, Faf du Plessis’ 120 had guided the hosts to a sub-par score of 269/8 in the allotted 50 overs. Brief scores : South Africa 269/8 in 50 overs (Faf du Plessis 120, Chris Morris 37; Kuldeep Yadav 3/34, Yuzvendra Chahal 2/45) lost to India 270/4 (Virat Kohli 112, Ajinkya Rahane 79; Andile Phehlukwayo 2/42, Morne Morkel 1/35) by six wickets. South Africa opted to bat first on a Kingsmead track that looked ideal for batting early on and with an in-form Aiden Markram coming in for AB de Villiers, their batting depth hardly got diminished. India came into the match with two wrist spinners hoping to capitalize on the dry nature of the pitch with Ajinkya Rahane’s Test form helping his selection ahead of Manish Pandey. Though India looked to start the game on the back foot after Virat Kohli admitted that India would have batted first had they won the toss, it didn’t stop them from having a desirable start to the game. Hashim Amla and Quinton de Kock’s slow start encouraged Indian bowlers to go for the early kill and one of Jasprit Bumrah’s attempted yorker soon found Amla’s pad in front of the middle. Though skipper Faf du Plessis’ immediate offensive approach helped South Africa accelerate the run rate to almost six per over, it was abruptly interrupted when de Kock decided to walk off without reviewing the lbw decision from Yuzvendra Chahal’s delivery, which was later revealed to be a not-out. The early jolt had clearly unsettled the batsmen and a nascent under pressure Aiden Markram was soon seen returning to the pavillion, when Hardik Pandya showed good reflexes to latch on to his loose shot off Chahal’s delivery, yet again. South Africa were reduced to three wickets for a paltry 103 runs at the halfway point of their innings. For all the talk about JP Duminy’s comeback, the all-rounder could add just 12 runs to the scorecard before chinaman bowler Kuldeep Yadav outfoxed him to scalp out his middle stump with a yorker. Just when one thought Proteas’ condition couldn’t get any worse, the dangerous David Miller was send packing by Yadav again as Kohli pulled off a spectacular diving catch, reducing the hosts to 134/5 in the 28th over. With hardly any regular batsman remaining all eyes were on the captain, who desperately needed support from the other end. Chris Morris walked in to stabilize the ship and the duo forged a 74-run partnership to take the score over 200. The partnership eventually came to an end in the 41st over when Yadav struck again, taking out the off-stump as Morris missed a giant attempt of sweeping the ball. The skipper went on to make another 56-run partnership with Andile Phehlukwayo next, bringing up his 9th ODI hundred in the process before Bhuvneshwar Kumar finally got his wicket in the 49th over. Kagiso Rabada soon followed suit in an attempt to get Phehlukwayo on strike from a wide ball, as South Africa ended their innings posting a target of 270. With the target more than gettable for the batting-rich Indian line-up, the visitors started in the calmest of manners, and Rohit Sharma’s monstrous six off Morne Morkel’s short ball showed their confidence. However, just when the opening pair looked at ease, Morkel’s fuller than good length delivery found a leading edge of Rohit’s blade before trickling safely into de Kock’s gloves. Kohli came in next with a settled Dhawan at the crease with the asking rate just over five. With the pitch hardly having any movements for the bowlers, the pair knew that staying at the crease would be more than enough to see off the game. However, just when things looked completely in control a havoc miscommunication between the batsmen saw Dhawan getting run-out as Markram didn’t miss from the backward point. A good lbw appeal by Chris Morris looked to have unsettled the left-handed batsman, who spotted Kohli’s run very late as India were reduced to 67/2 in the 13th over. However, an in-form Ajinkya Rahane steadied the ship alongside the skipper as they set to build yet another partnership, taking India’s innings to 136/2 at the half-way mark. The South African bowlers had already missed their chance to capitalize on India’s early collapse and Kohli and Rahane made sure they regretted it. The pair was settled on a 69-run partnership when Kohli brought up his fifty and Rahane, at 27, growing into the game with every run. Rahane brought up his half-century in the 35th over, as the duo forged the third highest wicket stand for India in SA surpassing Sachin Tendulkar-Mohammad Kaif’s 102 Pakistan in the 2003 World Cup. However, just when the duo looked to finish things off for India, Rahane brought the 189-run stand to an end as he was caught by Imran Tahir off Phehlukwayo’s delivery. Kohli soon followed suit but not before bringing up his 33rd ODI ton and leaving the outcome already decided in the hands of MS Dhoni and Hardik Pandya. The memorable Durban ODI ended with Dhoni’s flamingo pull off Rabada’s delivery as India won by six wickets to lead the six-match ODI series 1-0.